Baker Mayfield has had this edge forever. A lightly recruited prospect out of an Austin prep powerhouse, he showed up at Texas Tech in 2013 and became the first true freshman walk-on quarterback to start a season-opener in major college football history. After losing the job to Davis Webb later that year, he transferred to Oklahoma without any assurance from Bob Stoops that he’d even be allowed on the team. He’s now in his third year as the Sooners’ starter. So you might surmise that Mayfield’s flag-planting antics Saturday night following a blowout at Ohio State stemmed from a perceived slight—he didn’t like how the Buckeyes had celebrated on his home field in 2016, and was going to respond in turn after he and the Sooners returned volley. And guess what? There’s another slight coming for him. While squarely in the race for the Heisman Trophy, there hasn’t been much talk about what he could be as an NFL quarterback. Ditto for the guy who actually beat him out for the Heisman last year, Louisville’s Lamar Jackson, who is no less electric now than he was a year ago. Jackson and Mayfield were the stars of college football’s second full weekend of games, so why aren’t we hearing more about them as prospects? That’s the kind of question we’ll try to answer in this space over the next few months. I like college football every bit as I love the NFL, and it’s always been that way for me. Hopefully that passion, paired with my network of scouts and executives, will show here. And I couldn’t think of a better place to start this column than with the two guys who, despite incredible starts to 2017, haven’t been part of the draft hype train. As so many of us have focused on Josh Rosen, Sam Darnold and Josh Allen (to be clear, we’ll talk plenty about those guys here) because of their obvious NFL traits, the guys who finished 1-2 for the Heisman have become relative afterthoughts. But Mayfield and Jackson forced their way back into Football America’s consciousness on Saturday. Mayfield played football Houdini (again) in Columbus, riddling a defense stocked with NFL talent for 386 yards on 27 of 35 passing and three touchdowns. 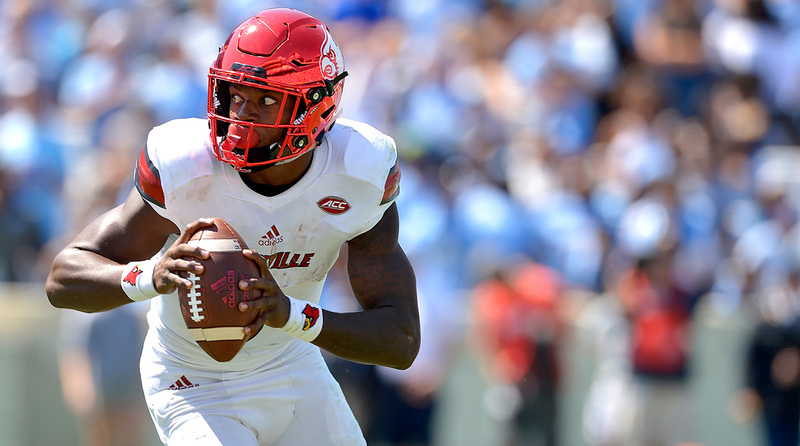 That was a few hours after Jackson took over Louisville’s game at North Carolina, hitting on 25 of 39 for 393 yards and three touchdowns, while rushing for 132 yards and another three scores on 19 carries. That’s what they are as college players. As for what they could be as pros, it’s clear that neither guy plays the position the way the NFL draws it up. So here, based on a bunch of discussions, is a snapshot of each quarterback as a prospect . . .
Of those I polled, I could only find one evaluator who believed that Mayfield had a legitimate shot at going in the first round. Most think he’ll go in what one scout referred to as “Dak Prescott territory,” which is to say somewhere in the middle rounds. Mayfield also has the swagger of Manziel, and the propensity to party—as his arrest in Fayetteville this summer illustrated. But as those I know in that area explain it, Mayfield has shown a greater commitment to football, and isn’t into celebrity culture the way that Manziel was, which is part of why he’s universally loved as one of the guys in the Oklahoma program. One consistent comp I got, once we got past Manziel, was Colt McCoy. Another was Russell Wilson, without quite the arm Wilson has. 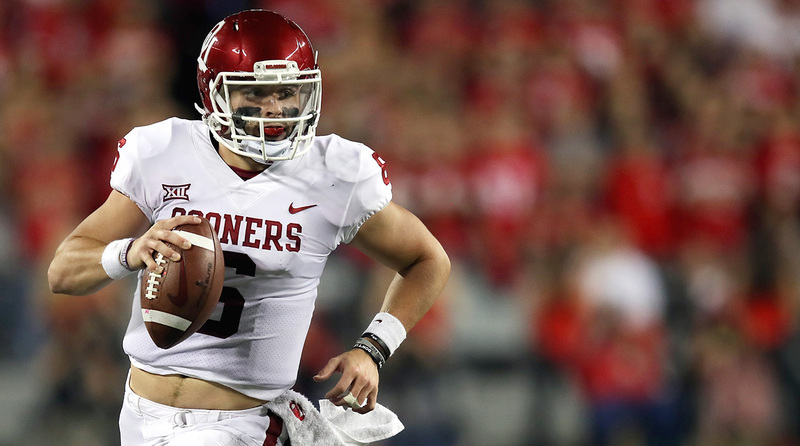 Mayfield will have to prove he can play on schedule in the NFL, since he’s done so much off-tempo as a collegian, and there will be a learning curve coming from the Sooner spread. But you can bet he’s confident he’ll have a long pro career. And he might be right. As a passer, the ball jumps off Jackson’s hands with tight spin and good velocity, so arm strength will not be a problem. What will be the problem? First, there’s his body. He’s listed at 6' 3" and 212 pounds, but looks a little shorter and lighter than that, and is built more like a basketball player than a football player, with a frame that may not lend itself to getting much bigger. The question then becomes whether or not you’ll be able to truly get the most out of his unique ability as a runner without risking injury. And two, there’s translation to the NFL. As it stands now, he’s considered more raw than Patrick Mahomes was coming out of Texas Tech a year ago, which is to say he’s got a lot to learn. It doesn’t mean he can’t do it. It just means he’ll have to do it, and that makes him a projection. Here’s my suggestion: Enjoy watching these two play while you can, because neither is as easy to plug into the NFL as Allen and Darnold and Rosen are. Though, conversely, it may not be smart to bet against them. 2. There was one Stanford DB who acquitted himself well in the USC beatdown: junior safety Justin Reid, the brother of 49ers safety Eric Reid. The younger Reid might not be quite the prospect his brother was, but flashed the talent and toughness to go in the first two or three rounds. 3. Washington State’s Luke Falk was one quarterback I was told could rise into first-round consideration. Saturday night’s thriller against Boise didn’t help his cause. Falk was benched, then hurt, and then backup Tyler Hilinski came into to a lead a furious comeback from a 31-10 deficit, bolstering the idea that the starter’s gaudy numbers are a product of Mike Leach’s Air Raid system. 4. Notre Dame’s continued struggles, and DeShone Kizer’s emergence in Cleveland, certainly seem to give new color to what transpired in South Bend last fall between the quarterback and coach Brian Kelly. 5. Want to look way ahead? The 2019 draft figures to be out of this world when it comes to defensive linemen. Among the true sophomores who have that top-5-pick look to them early in 2017: Ohio State’s Nick Bosa, Michigan’s Rashan Gary and Clemson’s Dexter Lawrence. ​1. 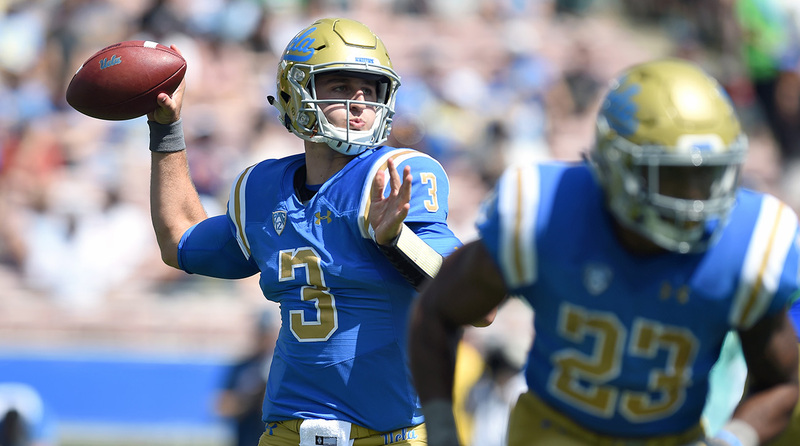 Josh Rosen, UCLA (22-25, 329 yards, 5 TDs, 0 INTs vs. Hawaii): I wanted to put Darnold here, but since we didn’t do this column last week I used Rosen’s two-game start (including the A&M comeback) as a tiebreaker. He’s got plenty of off-field questions he’ll have to answer, but thus far he’s left little doubt about his ability when the lights come on. 2. 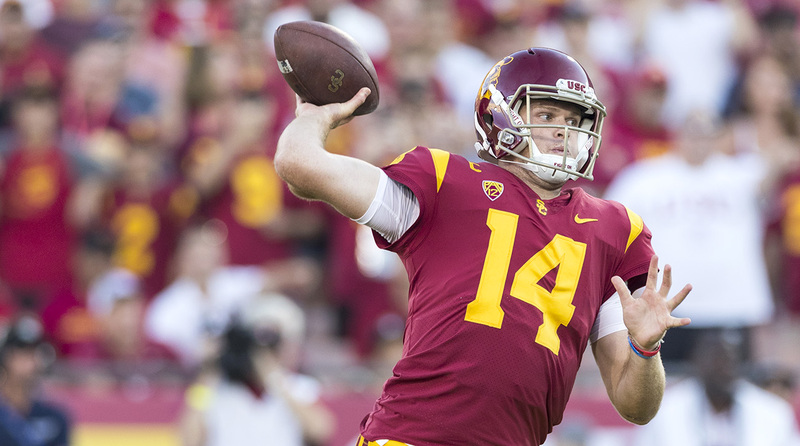 Sam Darnold, USC (21-26, 316 yards, 4 TDs, 2 INTs vs. Stanford): The other tiebreaker here is turnovers, but Darnold was spectacular in leading the Trojans to 42 points against the always-tough Stanford defense. This was a 1 and 1A kind of week on the leaderboard. 3. Josh Allen, Wyoming (22-32, 328 yards, 2 TDs, 0 INTs vs. Gardner-Webb): Allen quietly rebounded from a rough opener against Iowa. Under Center, Ahead of Schedule: What's With All the True Freshman QBs? ​Helped Himself: Mississippi State’s Nick Fitzgerald has, without question, benefitted from how ex-teammate Dak Prescott has transitioned to the NFL. The good news? Fitzgerald’s play is justifying the looks he’s getting from scouts. He and the Bulldogs made quick work of Louisiana Tech, as he threw for 124 yards and three touchdowns and rushed for 111 yards and two more scores before exiting the blowout win early. Things get interesting this week with LSU coming to Starkville. Hurt Himself: The son of Cowboys offensive coordinator Scott Linehan, Idaho’s Matt Linehan has landed on the NFL radar. But the fact that he plays at Idaho, and faces mid-major competition week-in and week-out, means he’s has to be really good consistently in order to remain on the radar. And that’s why a middling performance (22-34, 261 yard, TD, INT) in a blowout loss to a UNLV team that lost to Howard the week before figures to hurt his cause. Keep an Eye on: Ex-Michigan blue chip recruit Shane Morris, who lost the 2016 quarterback derby in Ann Arbor and has since transferred to Central Michigan for his final college season. Thus far, he’s making the most of it. He threw for 467 yards and five touchdowns against Kansas on Saturday, and gets another Power 5 opponent this week with a trip to Syracuse. Wyoming QB Josh Allen vs. Oregon (CBS Sports Network, Saturday, 7 p.m. ET): The opener against Iowa was Allen’s first shot at a Power 5 team during the regular season. This week’s home game against the Ducks will be his last one. I don’t think it’s a leap to say that one knock-in-waiting against Allen is level of competition, so after going 23-for-40 for 174 yards and two interceptions in that 24-3 loss to the Hawkeyes, the opportunity here is golden for the fourth-year junior. Particularly since Oregon—who beat Nebraska on Saturday—might be better than expected.